When Karl Blade started working at Family Counseling Agency of Tucson, George H. W. Bush was president of the United States, Johnny Carson was host of the Tonight Show, and Kris Kross was demanding that people jump, jump. A lot has changed in the 25 years since then – we’ve had four new presidents, the Cubs won a World Series and Family Counseling Agency merged with Our Town to become Our Family Services. But Karl is still here, still dedicated to serving our community’s most vulnerable people: homeless youth. You might have seen him around. 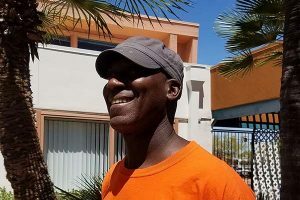 Well over six feet tall and clad in a bright orange t-shirt, Karl cuts a conspicuous figure on the streets of Tucson as he hands out food, water, hygiene packs, and business cards. His job takes him all over the city: Fourth Avenue, downtown, bus stations, gas stations, parks, camps, tunnels, washes, and anywhere else homeless youth congregate or live. Karl is a member of Our Family’s Street Outreach team, which seeks to engage and connect homeless youth with an array of supports such as access to shelter, case management, counseling, and legal services. Once that trust is built, and the youth decides that they’re ready to make a change, they pull out Karl’s old, crumpled business card from their pocket and call him. Or, sometimes, they’re even waiting outside Our Family when he pulls up in the morning. Karl talks about his client, “Mark.” The team initially found Mark sleeping behind the Quincie Douglas library at the corner of Kino and 36th Street. Mark has had a rough life: he suffers from schizophrenia, autism, and had a very limited ability to care for himself. After his parents died, Mark quickly found himself on the streets. Why has Karl stayed for 25 years? “I like interactions with the kids, the coworkers I’ve had over the years, and the stability of the agency,” he says. “It’s challenging, but my coworkers make it enjoyable. There’s never a dull moment.” And even, sometimes, kids from the program will come back years later to thank him. They tell him about their job, their spouse, their kids… Try to give him all the credit. He’ll take some of the credit, but reminds them of all the hard work they put in to get themselves to this point. After all his years of service, Karl sometimes jokes about retirement, but we at Our Family Services hope he stays another 25.